Jagranjosh.com, India’s leading education portal, presents CBSE Class 10 Science Guess Paper for Sumamtive Assessment-II, 2016-17. This Guess paper is specially prepared by the subject experts after the brief analysis of previous year question papers. The paper contains entirely fresh questions picked from the most important topics of Science. This paper will help the students in understanding the depth with which a topic should be studied in order to prepare in a more effective way to get the desired results. Solution for this Guess paper will be out very soon. Till then, give it a try to solve the paper to check your preparation for the coming exams. • understand the latest examination pattern. • get aquainted to the important topics to be studied for SA – II Science Exam. • learn time management to complete the paper in within allotted time constraints. Q. What kind of mirror is used in big shopping stores to watch activities of customers? Q. (a) Give the evidence that the birds have evolved from reptiles. (b) Organism like insects, octopus, planaria and vertebrates possess eyes. Can this similarity be taken into account for them to group together. Justify your answer giving reason. Q. State and explain the various birth control methods? (a) What colour of stem would you expect in the F1 progeny? (c) In what ratio would you find the genotypes GG and gg in the progeny? Draw flow chart in support of your answer. 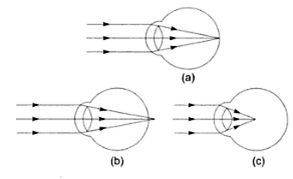 Draw labelled ray diagrams to show the formation of image in each of the above two cases. (c) Predict the nature and size of the image of a toy kept in front of a concave mirror; if the object distance is R/3? Q. What do you mean by ‘eye donation’? Who takes care of the donated eyes? Name the type of blindness that can be treated by this? What are the various conditions to be checked for a man to donate eyes? Mention the basic things we need to know and take care of if eyes have to be donated. Q. Will a convex lens whose upper part is covered with a black paper, produce a complete image of the object? Verify your answer with the help of ray diagrams. Next Article CBSE Class 12 Maths Paper 2017 Will be Easy or Tough?